According to the 2 legal experts prediction on Chief Justice Corona impeachment trial, the senator-judges will bring down a guilty verdict. It is due to failure to disclose his true wealth. University of the East College of Law Dean Amado Valdez said, "the prosecution was able to prove its allegation that Corona failed to disclose his true wealth in his Statements of Assets, Liabilities and Net worth (SALN)--with the help of the defense." While the other one legal expert predicted that there are 19 senator-judges voting “guilty.” which is above the minimum to the 16 votes required for a conviction. Vice-president for legal affairs at the University of Manila Dean Joe Bisquera said, "There are 11 senators who will vote ‘guilty’ and there are 8 swing votes who I also feel, by Monday, will also vote ‘guilty.’"
Panfilo Lacson, Aquilino Pimentel III, Antonio Trillanes IV, Jinggoy Estrada." Meanwhile, Sen. Juan Ponce Enrile will bring down the verdict after the prosecution and defense give their final arguments on Monday and final verdict on Tuesday. 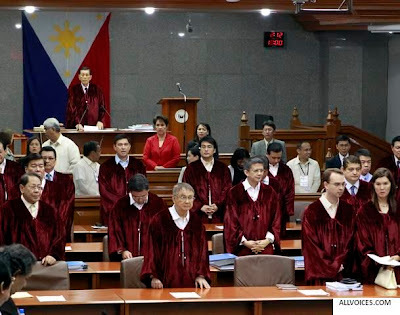 You may watch the live coverage of Corona Impeachment Trial here. Comments or suggestions about "Legal Expert: Chief Justice Corona on Guilty Verdict" is important to us, you may share it by using the comment box below.